We made it! God has given the people generous hearts that believe in what He can do through missions. Through the financial support of RCC attenders, the missions committee, our family & friends, fund-raisers and our own scrimping, saving, & sacrificing, we have arrived at the $10,000 we need to fulfill this mission trip. We even had a few donations from complete strangers who wanted to help. Whether you gave $5 or $1000, we thank you from the bottom of our hearts. We hope that you will follow along our journey here and see what God does with your gift. Enter your e-mail address and click the follow button on the left or like our facebook page to see updates. This entry was posted in Preparing for the Journey and tagged donations, fund-raising, missions, support. Wow. We have made tremendous progress since our last financial update. 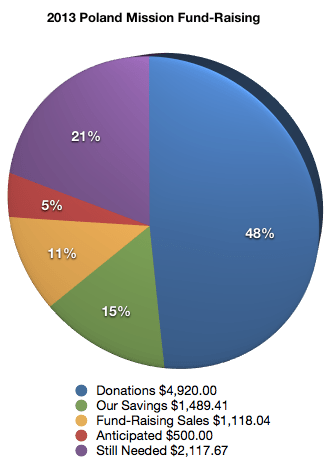 A few bracelet sales, some generous donations and a successful yard sale have shifted our graph dramatically. Thank you to all who had any part in any of those things! 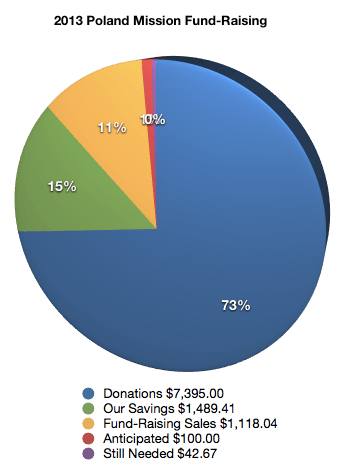 We are entering our final week of fund-raising. I have gotten permission to delay the sending of the check to Poland Christian Ministries until Monday, which gives us one more full week to cover the $2,118 that we are currently short. Still seems like a lot of money to me, but I know God’s got this. The wonderful Autumn McFall is donating 90% of her MaryKay sale profits to our trip this week, bracelets are still for sale and make amazing Mother’s Day gifts (in case you aren’t aware, Mother’s Day is May 12! ), there is one more Sunday to slip a contribution in the offering plate (designated Porter Poland Mission), and 7 more days to donate online. If you have been feeling a little tug to be part of this, here’s your chance. We are going because we have the time, desire and passion to do so. Not everyone has all those things, but you can still be part of what God is going to do. Don’t worry if you can’t help much. Small donations add up in a hurry. We thank you in advance! This entry was posted in Preparing for the Journey and tagged donations, fund-raising, mission trip, support.